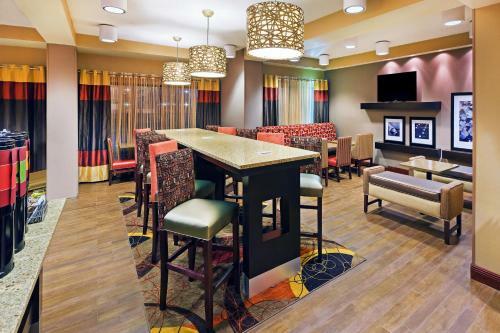 Just 3 miles from Arkansas State University, this Jonesboro hotel offers a free hot breakfast and free Wi-Fi. The eateries and shops of downtown Jonesboro are 3 minutes' drive away. All rooms at Hampton Inn Jonesboro come with cable channels, including HBO. A tea/coffee maker comes as standard, and some accommodations feature a spa bath. Jonesboro Hampton Inn offers a fitness room and an outdoor pool. For some outdoor activity, the 18-hole golf course of Jonesboro Country Club is about 3 miles away. Hampton Inn Jonesboro offers a business centre, with a free printing service. the hotel Hampton Inn Jonesboro so we can give you detailed rates for the rooms in the desired period.